The whole idea is a wonderful concept, and one that us much needed. With so many people regretting their timeshare purchase and wanting desperately to get rid of them, the service could really benefit a lot of people. There are many companies providing the service, and while they all offer their own individual results, the most common is the quick and easy sale of the property to another private party. While the concept was developed with good intention, it wasn’t long until the scammers jumped on the bandwagon and saw this as a great opportunity to take money from innocent people. Not only are we talking about the typical scammers we are all used to (were you aware the warranty on your vehicle is expiring! ), but seasoned timeshare reps all over saw the opportunity to make a quick buck as well. That’s right, the timeshare reps that were responsible for tricking so many of these people into ownership in the first place, was now going to represent them and help bring them justice. Fast forward a few years later, the industry may be more dangerous to consumers than the timeshare industry itself. Most people end up paying fees of several thousand dollars with the promise of results, only to be strung along and ultimately realize they are no closer to getting rid of their property than they were to begin with. 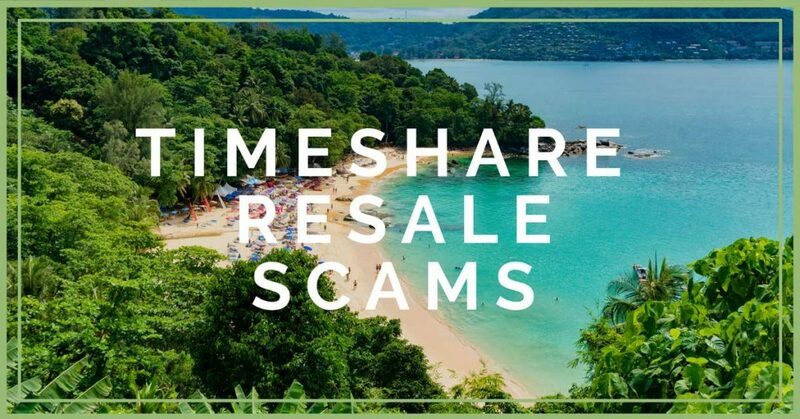 I have personally heard stories of people investing over $15,000 into a timeshare resale scam. Here are a few red flags that you should be cautious of, based on the information provided by Consumer Reports. Watch out for up-front fees. Generally, fees are paid at the conclusion of the service, or are taken out of the settlement. Most scams will come with the guarantee of a quick sale. If you have tried to get rid of your property yourself already, you know that nobody can guarantee a quick sale. Don’t wire money, pay in cash, or send a money order, certified bank or cashier’s check. These methods are extremely difficult for law enforcement to track. It will basically be lost. Stick with personal checks or wireless transfers. Don’t be so quick to assume that the company has a nice website and social media pages that they must be legit. Contact your State Attorney General and local consumer protection agencies in the state where the reseller is located. Don’t forget to check the Better Business Bureau as well. Check to see if your resort has any restrictions, fees or limitations that would contradict what the resale team has been telling you. Every promise, request and payment proposal. Be sure to have an attorney available to review the documents as well. While there are honest companies out there providing this service, it seems there are more scammers looking to take advantage of someone. If you do find yourself negotiating with a timeshare resale company, just be sure to watch for these warning signs and protect yourself.